I have been a bit bad lately and really haven't been doing any cooking, let alone trying new recipes or anything like that. 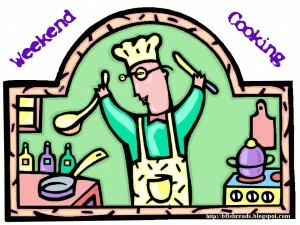 As a result, a lot of my recent Weekend Cooking posts have been more about recent experiences rather than recipes or book reviews etc, and this week is no exception. 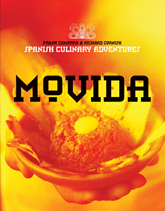 Last night I had the great pleasure of going to dinner at Movida Aqui here in Melbourne. The original Movida is a very popular tapas bar but it is incredibly hard to get into especially on a Friday or Saturday night. When we were making arrangements to catch up with a couple of friends for dinner, we thought we might try one of the more recent additions to the chain (there are now four different Movida venues) and were not disappointed by our experience. Last night it was a gorgeous autumn night! Clear skies, warm and the perfect night to sit outside, eat tapas, drink sangria and chat! One of the really fun features of the setting was that we were sitting next to a planter box. It was only after a little while that we realised that the trees in the planter box were young olive trees, and at the base of the trees, a variety of different herbs! The kitchens are very open at this restaurant, so you could see the chefs at work. Very cool! Really the toughest thing was walking through the restaurant looking at what everyone else was eating and thinking either we should have ordered those, or I wonder what that is, because everything looked really good! Drinking sangria reminds me of a fantastic night I had in Barcelona many years ago, and if I had someone who liked paella, I would definitely go back to Movida Aqui specifically to share a paella pan, and yes, more sangria! I love the idea of tapas - a selection of little bit sized morsels of tastiness that you share with others at your table. It doesn't end up being a particularly cheap way to eat, but it is a nice way to treat yourself! I didn't take any photos because I only had one battery in my camera for some reason. Not all of the items are showing on the menu on the website so from memory this is what we had last night. As I was sitting here this morning, I was trying to think what my favourite was. I didn't actually have any of the smoked salmon because it's not my favourite taste, but other than that, they were all delicious. I think the dish I was most surprised by was the potato salad with dill. The prawns that were served with it were chargrilled (I think) but they were still very tender and the perfect accompaniment to the potato salad with dill. Having just been for dinner at Movida I was reminded that there are two Movida books out (pictured), and my library has them both, so perhaps a later edition of Weekend Cooking might feature one of these books! Good weather, good food and wine, good company. What more could you ask for? I love paella...but all those dishes sound delicious. I will join you for a paella dinner! All the dished sound wonderful. I love tapas, but my small town doesn't not have a tapa restaurant. 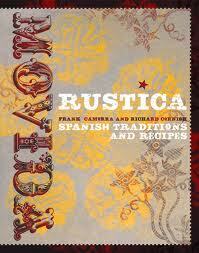 I just checked and my library doesn't have much in the way of Spanish cooking. It all sounds so good! What a fantastic evening! Tapas, and Sangria, on a beautiful evening, sounds like perfection! What a wonderful night! Tapas always sounds good to me because my ideal dinner is to have alot of appetizers and no big entree and some restaurants are ok with that, but some aren't. Tapas and sangria sounds wonderful. I like hearing about Movida. You described it so well I could see it in my mind's eye. I'd love to go have a pan of paella with you too. "Good weather, good food and wine, good company. What more could you ask for?" Nothing really! Ain't autumn wonderful. 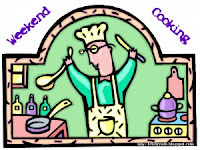 I finally decided it was about time I jumped on the weekend cooking "train". I cook and bake a lot so it makes sense that I share too. Your post has really made me feel nostalgic for summer (or spring, in this hemisphere we're eagerly awaiting the moment we can ditch the winter coats). To me, tapas & sangria (and good company!) symbolize summer! Sounds like a lovely meal. I love your description of the planter box! Reading this post makes me a tiny bit jealous. We are hours away from fine dinning which means of course we generally cook our own - Indian this year. But every once in awhile I'd like to go out, not have to cook and enjoy the company of friends. Sounds like it was a lovely outing.